TAPS' Engaged Scholars program seeks concentrators who are interested in studying the theory and practice of performance, while simultaneously working in partnership with local communities to co-create and investigate complex social issues. Engaged Scholars in TAPS build community, break down hierarchies and prejudgments, and tell stories about who we are and who we can become as citizens and stewards of the earth. TAPS and the Swearer Center have developed partnerships with local arts organizations such as AS220, Trinity Repertory Company, Providence Youth Arts Collaborative, Central Falls High School, Trinity Academy for the Performing Arts, Shakespeare in the City, Pushed Learning, The Funk Underground, RI School for the Deaf, and Troupe Yeredon. Provide students with structured ways of reflecting on the connections between classroom learning and real-world experience, with the goal of developing civic-minded leadership and innovative curriculum. "I have taken three Engaged courses within the TAPS department, Mande West African Dance, Music, and Culture, New Works/World Traditions, and Dance History in the 20th Century. All three courses allowed me to engage with the Providence community and establish relationships with local artists and students, and they opened my eyes to new ways of integrating my academic pursuits with my love for the Arts and Education. Explores basic acting/directing concepts from a variety of perspectives including the use of the actor's imagination/impulsivity in the creation of truthful, dramatic performance; the body, as a way of knowing and communicating knowledge; and the voice, as a means of discovering and revealing emotion/thought. There is a mandatory tech requirement and some evening hours are required. Please go to the TAPS website for specifics on admission and the technical requirement (http://brown.edu/go/TAPS0030). Enrollment limited to 18 first-year students. Instructor permission required. No permission will be given during pre-registration. 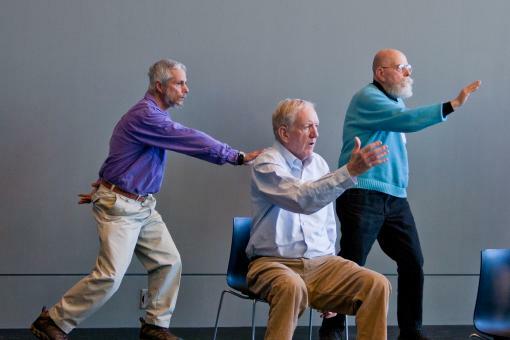 TAPS 1281Z - Artists and Scientists as Partners focuses on current research on and practices in arts and healing, with an emphasis on dance and music for persons with Parkinson's Disease (PD) and Autism Spectrum Disorders (ASD). TAPS 1330 - Dance History (in collaboration Deanna Camputaro, master teacher with the Arts, Communication & Teaching Academy (ACT) of Central Falls High School), invents new relationships between academic content, new pedagogies, and community engagement. TAPS 1370 New Works/World Traditions is an Engaged Scholarship course at Brown University with a focus on training young actors, musicians, and dancers in Mindfulness practices towards the development of new theatre for the stage, street and screen. Here international and professional artists work closely with New Works members to educate, deliberate and inspire social engagement through cross-cultural exchange and co-creation. These new works address important political, public health, and social landscapes and exist at the intersection of science, art, and social activism. Comprised of Brown University faculty, alumni, undergraduate students, graduate students, professional international artist-activists and community partners, TAPA, CityArts, Troupe Yeredon, Pushed Learning and The Funk Underground. For general inquiries about the Engaged Scholars Program, please contact [email protected] or go to the Engaged Scholars page on the Swearer Center web site. How to Apply: At the time of their declaration, students declare their concentration in TAPS with an Engaged Scholar focus. Students apply to the program in the ASK advising system while declaring their concentration. Advising and mentoring is critical to the Engaged Scholars Program, from course selection to practicum development. As a general rule, academic departments and programs provide advising through faculty advisors for course selection and capstone development. ESP staff primarily advise on practicum development, and also provide ongoing advising about program requirements. Student participation in the program is tracked by ESP staff and concentration advisors in ASK. We encourage ESP students to continually update their concentration course plan in ASK to include engaged courses. Additionally, the ESP Canvas site, available to ESP students and viewable by advisors and ESP staff, provides more information about program requirements and is a platform for submitting program requirements, including practicum work plans and reflections. Work with track advisors and with the departmental ES advisor, students determine which ES-designated courses in the array of those offered (see box) match their track-work. Students participate in programming and activities with other Engaged Scholars from a variety of departments and disciplines. ESP students take a required 1/2 credit seminar, SOC 310: The Theory and Practice of Engaged Scholarship, that examines the theory, practice, and ethics of engaged scholarship through readings, case studies, site visits, and visits from faculty and practitioners. The course examines the field of engaged scholarship, highlights local community-university relationships and projects, and situates students’ studies at Brown within these contexts. Students emerge from the seminar with a critical understanding of engaged work and with practical skills to continue their community-engaged scholarship. Students also develop relationships across disciplines with other ESP students through the seminar and spend significant time researching capstone plans. We recommend you complete this course during the first semester of junior year. Students with an ES focus gear their capstone projects to a conceptual and practical culmination of their work in this vein.